The Chai Five Club is a group of alumni, parents, friends and partners dedicated to help guarantee that the Oberlin Jewish community is best served through securing a consistent foundation of monthly financial support. We hope we can count on you just as the students and community count on us. It is thanks to those who selflessly give of themselves to support Jewish life at Oberlin College that we continue as the heart of Jewish life on campus and achieve our goals. 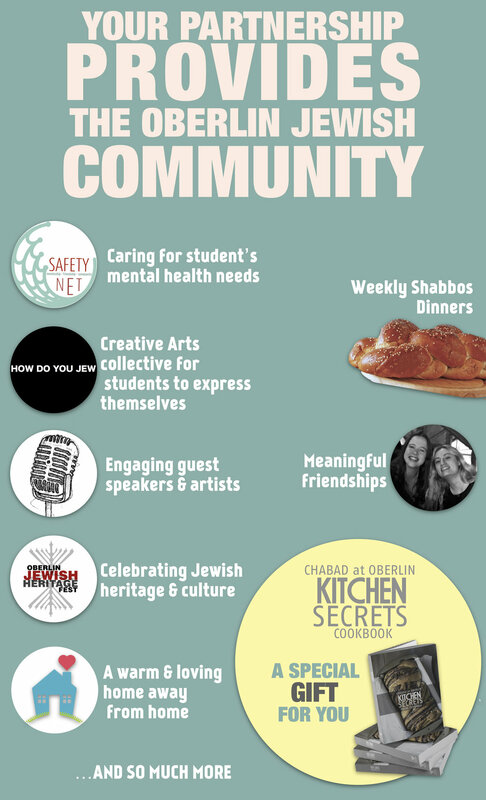 By joining the Chai Five Club, your partnership, combined with everyone else’s in this special club, will allow Jewish life at Oberlin to thrive and expand. Eighteen is the numeric value (gematria) of the word CHAI, meaning life in Hebrew and five times eighteen equals NINETY. This program is secure and convenient and it will provide the financial assurance to continue our vital work and its a great opportunity to give Tzedakah-Charity and support Jewish life and learning at Oberlin College. Join the Chai Five Club and receive a very special gift, exclusive to club partners. Just because you may not be in Oberlin doesn't mean you have to miss out on the deliciousness and magic that comes out of Devorah's kitchen.